Since cooking has become more “lively” as what Thai Chef Puwasa aka Chef Liew, the Head of Culinary Designer believes in, with the live cooking stations in an open kitchen in White Oven, SO Sofitel Hua Hin allows her to interact more with the diners from locally inspired Thai cuisine. mylifestylenews writes. White Oven serves authentic Thai cuisine from its succulent seafood dishes and creative snacks relished just steps from the ocean with a design centered around the eponymous white oven. 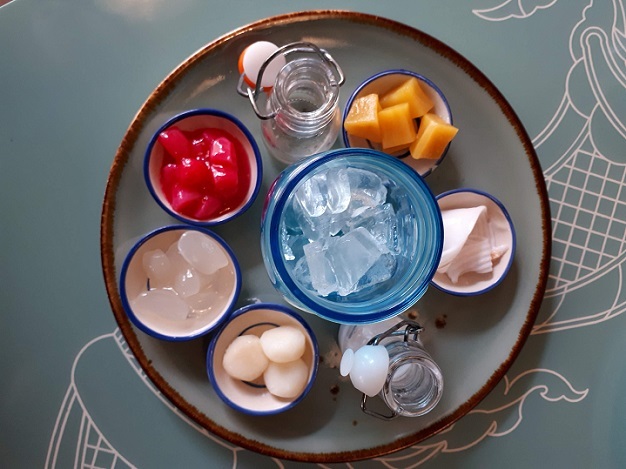 This All Day Dining venue has playful decorative touches, such as seashell chandeliers, fishing net designer lighting and lots of wood to create a vibe that is beach chic from its inspiration by the scenery of an underwater world. The seating is quite varied from high tables with stools, to freestanding tables with upholstered chairs and banquette seating down each side of the dining room and well spaced out so you are never too close to anyone. By using the finest and freshest ingredients from the garden and from the sea, this kitchen is putting on a fabulous buffet breakfast every morning and creating all your favorite local dishes for lunch and dinner from her crafted Thai a-la-carte menu. The menu has all your Thai favourites from street eats, to soups and salads, rice dishes and classic Thai dishes. 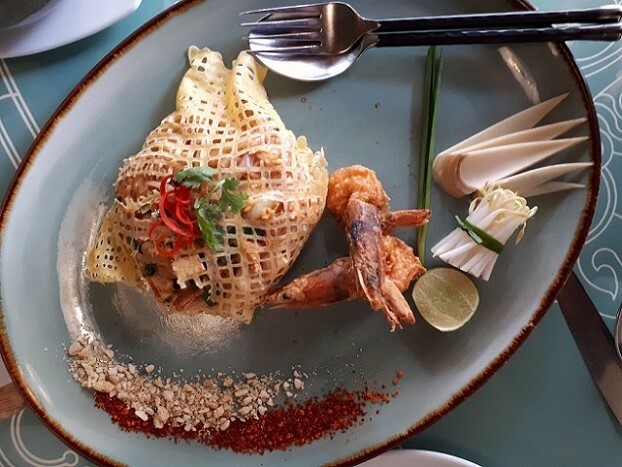 White Oven serves authentic Thai Cuisine – always with an innovative twist and lead by local Thai Chef Liew who had brought the local knowledge to enhance the local ingredients and produce to create a new Thai culinary experience. We thought the easy road would be to sample a good cross section with a couple of Chef Liew’s innovative dishes over lunch. First up was Yum Ta Krai Hoi Shell – seared Hokkaido scallops with spicy and sour lemongrass salad. The scallops were seared to perfection, the spicy and sour lemongrass salad added a very complimentary dimension on the palate to whet the appetite. 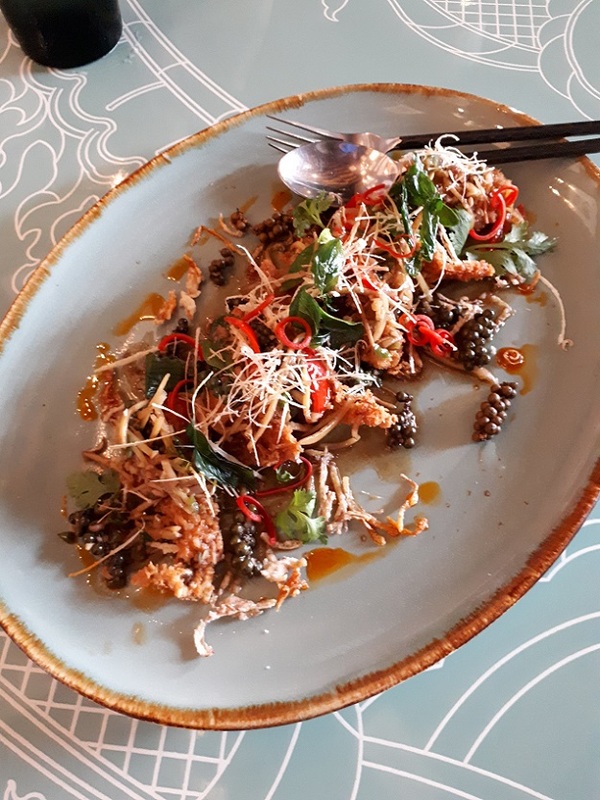 Soft Shell Crab followed – this stir-fried soft shell crab with ginger root and black pepper was quite delectable and delicately done with lots of fresh peppercorns to crank up the spice factor. Aromatics and the pungent flavours from the peppercorns, ginger and lemongrass are the soul of this dish and complimented each other making this dish a highlight at all times. Tom Kha Gai – galangal spiced coconut soup with chicken was a breather from the spices, but in a way was delicately spiced as well, but the coconut and unctuousness of the soup consistency created a memorable flavor and a delicate sweetness. Extremely tasty soup. Khao Pad Moo – wok fried rice with pork, egg and spring onion. This classic Thai fried rice with pork suits all age and the rice was fried to eliminate the moistness while the grains separated. Such a simple dish done right at its best! The Pad Thai Goong elevated by Chef Liew in White Oven is one of the most popular dishes. Not only from its eye-catching presentation but also its taste that is delicious and you can’t wait to dig in at once. The noodles were carefully wrapped over by a netted plain egg omelet and garnished with shredded red chili and parsley. The grounded peanuts and chili flakes were spread around at one side of the dish while the bean sprouts were perfectly tied in a bundle along with halves of lime and banana flower petals. These condiments can’t go without each other to make a good Pad Thai dish. Chef Liew deep fried the two small size prawns instead of being stir-fried together with the noodles in a generous serving. 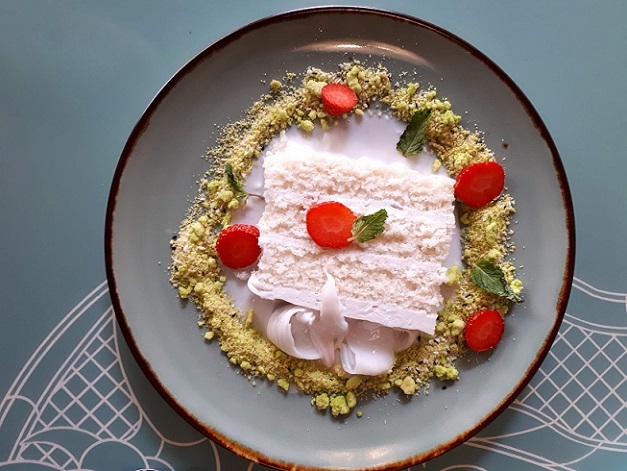 Young Coconut Cake – this coconut cake, with fresh coconut, pandanus crumble and sticky coconut sauce, would put many famous pattiserie names to shame as it was absolutely stunning in presentation and flavor. Finishing off a Thai meal with something sweet helps to cool down the palate should the preceding dishes be spicy. This dessert invention also puts a smile on our face with such a twist in presentation that one could only describe as ‘WOW’. The sponge component was dense and moist, the pandanus crumble is a touch of brilliance and the slices of strawberry adding a splash of colour and subtle flavor balance to the richness of the coconut. This is simply SO stunninig. Another dessert from Chef Liew’s menu that strikes our eyes is the Thaptim Krop – a classic Thai dessert with ruby chestnut, sweet potato in coconut milk. Chef Liew version of this most admired dessert by the locals separate all ingredients while being brought to the table with a small serving dish filled with all the condiments and a small bucket of ice cubes in the middle to be poured in and stirred well before consumption. It tastes as good as it looks.